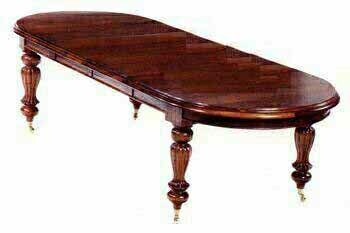 Solid Mahogany D ended extending Dinning Table. With hand carved, turned and fluted tapering legs. On solid brass casters. This table can accommodate 10 to 14 persons. Comes with 1 or 2 center fitting Leafs, enabling the table to extended to your requirements. Larger tables available. Ideal match to any of the Antique style chairs.